The Warwick Valley Central School District’s winning Odyssey of the Mind (OM) program was recognized at the Warwick Valley Central School District Board of Education meeting on Monday, September 11. 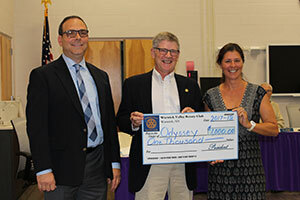 David Eaton, Board member and President of the Warwick Valley Rotary Club, presented Donna Denny, WVCSD teacher and Odyssey of the Mind Advisor, with a check for $1,000, to be used for the district’s OM program. Board of Education President, Lynn Lillian, also thanked Ms. Denny for her support, dedication and leadership of this valuable program.